Spring here is impressive and offers visitors the privilege to enjoy the wealth of vegetation and colors, combined with high-taste tourism. Summer is the most popular season for Corfu, with beautiful beaches and crystal water for unconcerned hours on the beach. Christmas and New Year's Day in Corfu is music, hymns, carols, in a quiet, decorated place with a mild climate and a noble finesse. Autumn is the season of vintage, the period during which the whole island smells of grapes; it may be the best time to get to know the routine of the island. • Spianada, the largest square in the Balkans, is the centre of the city, adorned with 19th-century remarkable works of French architecture. Here you can watch cricket games, or attend in musical concerts organized throughout the year. 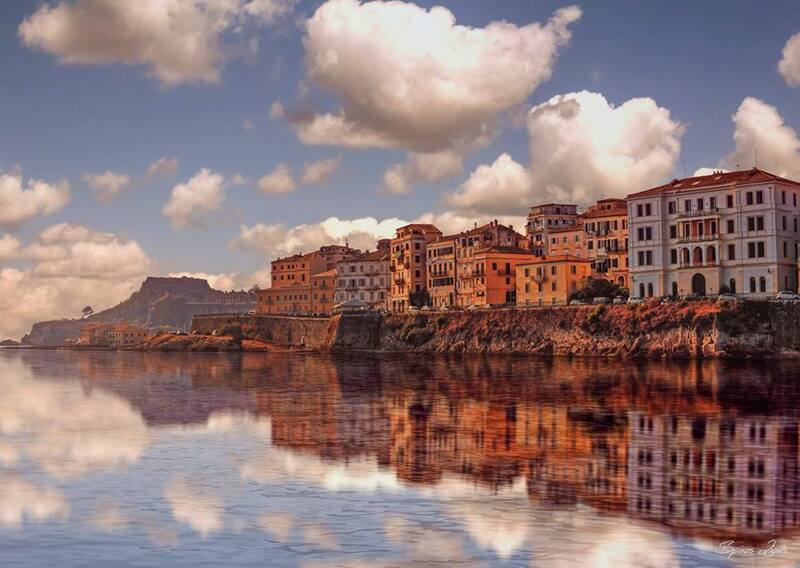 • Liston, the city’s trademark, where the aristocrats used to enjoy their evening promenades. The characteristic arcades form the most romantic background setting for a welcome cup of coffee at one of the town’s cosy cafes. Mon Repos Palace was built by the British Commissioner Adams as a gift to his Corfiot wife. It is a small but beautiful palace with colonial elements, which today operates as a museum. In this luxurious dwelling, Prince Philip, the Duke of Edinburgh and husband of Elisabeth the Second, was born in 1921. The park around the palace is ideal for long romantic walks. 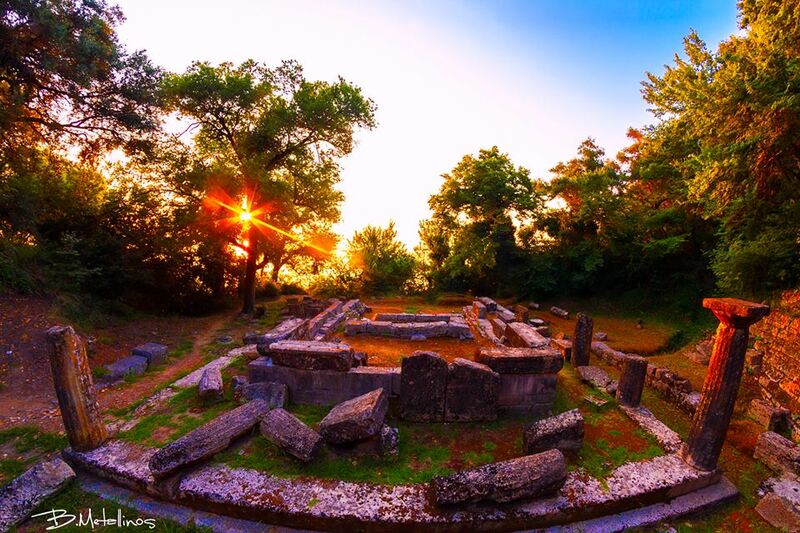 Paleopolis (at Mono Repos estate) stands where the Agora of the ancient city of Corfu was located. Admire the remains of several public buildings erected there along with sanctuaries, workshops and residencies. Kanoni (meaning canon) offers from its circular terrace an amazing view across the island of Pontikonissi (meaning Mouse Island), one of the most photographed spots of Corfu. According to the legend, this rocky islet was a Phaeacian ship that was turned into stone. 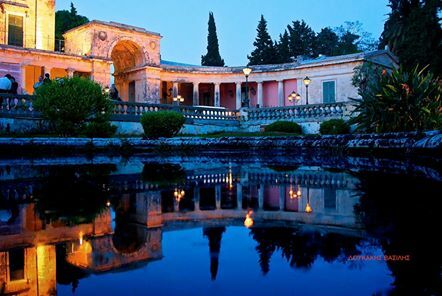 Achilleion is a fairy palace built among cypresses and myrtles by the Empress Elisabeth of Austria, who wished to escape from the Austrian court. 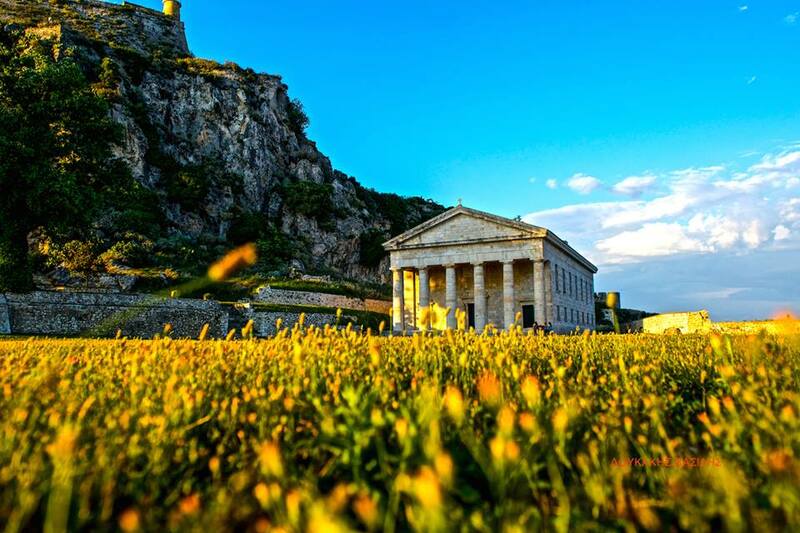 Elisabeth truly fell in love with the island, and she dedicated this palace to Achilles as she cherished the belief that he represented the very soul and fairness of Greece. A Byzantine castle that majestically reigns above the Paleokastritsa area with astonishing view is one of the most important fortified complexes of Corfu. It was an acropolis which surveyed the region all the way to the southern Adriatic and presented a formidable strategic vantage point to the occupant of the castle. Angelokastro formed a defensive triangle with the castles of Gardiki and Kassiopi, which covered Corfu's defences to the south, northwest and northeast. 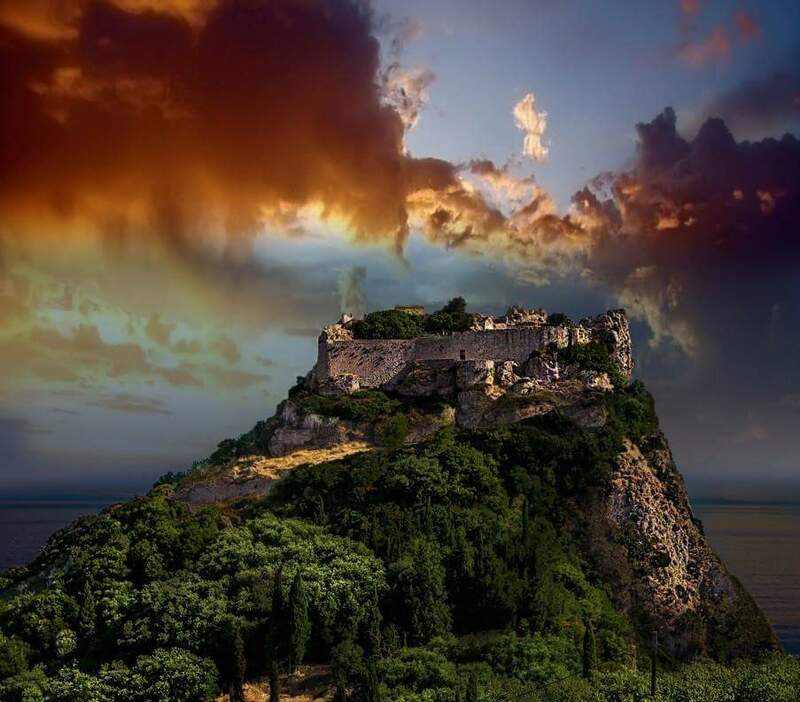 The castle never fell, despite frequent sieges and attempts at conquering it through the centuries, and played a decisive role in defending the island against pirate incursions and during three sieges of Corfu by the Ottomans, significantly contributing to their defeat. 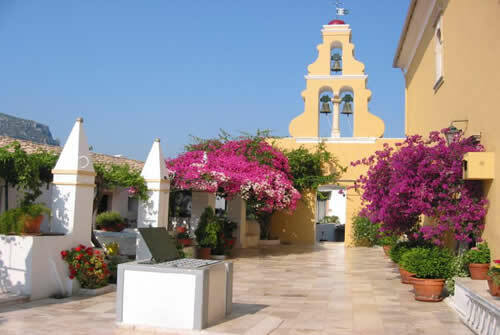 This historic village of Palea (Old) Perithia, situated in the North East corner of the island just below Mount Pantokrator, is the oldest permanently inhabited settlement in Corfu, dating back to the 14th century. There are only 130 houses, built entirely by hand, some of which have now fallen into ruins. The village with its cobbled streets and ancient houses is encircled by eight churches and set amidst beautiful countryside. Distinctive and picturesque, Old Perithia is designated as an area of outstanding natural beauty and is a protected heritage site, being an enchanting discovery for visitors from all over the world. 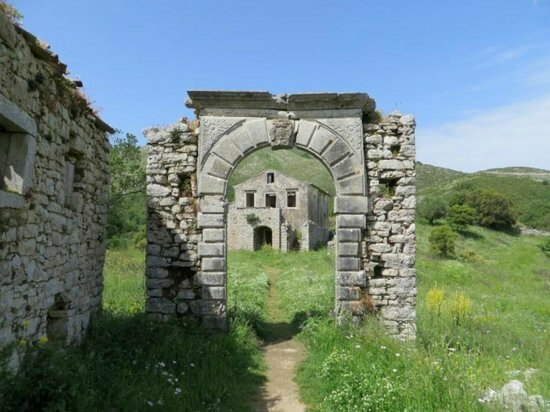 The men's monastery of "Panagia Paleokastritsa" in Corfu was established in 1225, although the building seen today is of the Ottoman era. The reason for the construction of the monastery was the finding of the sacred icon of the Most Holy Theotokos. In the 19th century, it intrigued the British Commissioners of the island, who opened up the road that leads to Palaeocastritsa. The monastery celebrates on August 15, the feast of the Assumption of the Most Holy Theotokos, as well as on the first Friday after Easter, when the feast of the Life Giving Fountain is celebrated. 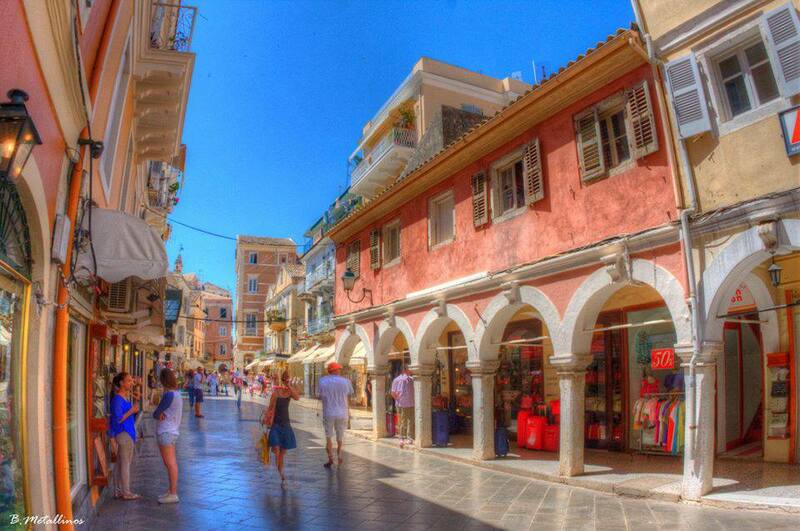 Corfu has always been a favorite place with artists, from writers and poets to painters, sculptors and musicians. 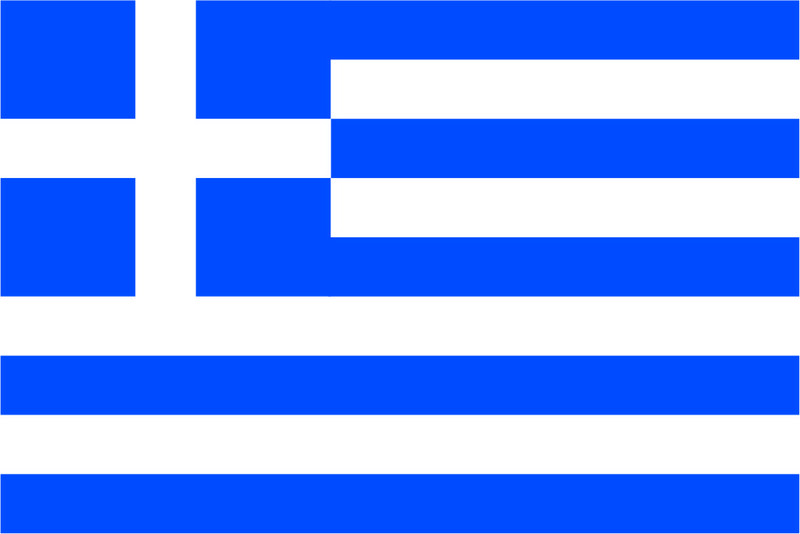 Just to give a few examples, the composer of the Greek national anthem Nikolaos Mantzaros and the composer of the Olympic anthem Spyros Samaras were both Corfiots and so are the more contemporary Vicky Leandros and Sakis Rouvas. This explains the fact that in Corfu there are a Department of Music Studies at the Ionian University, a Musical Gymnasium and Lyceum, 18 Philharmonic orchestras, 6 Conservatories, Choirs and traditional music ensembles, constituting a hotbed for talented musicians. The Philharmonic Orchestras of Corfu are renowned throughout the world. They owe their establishment to the general climate in which clubs and societies flourished in Europe during the 19th century, a climate with which the Corfiot studying at European universities had become familiar.The opportunity for the formation of the first Philharmonic society arose during the period of the British Protectorate, when a British military band performed at the island's important events. In 1837 however, the British refused to provide musical accompaniment for Orthodox processions. The Corfiots' reply came three years later, in 1840, when the Philharmonic Society of Corfu was founded. The enthusiastic response to rally round the Society resulted in a surplus of supporters, which in turn led to the creation of a new philharmonic band. With the passage of time the tendency to form similar musical groups extended to the whole island and thus today Corfu has 18 philharmonic orchestras. They are all non-profit making companies with the aim of extending musical education, providing scholarships to exceptional students, and performing at celebrations and events both in and outside Corfu. Corfiot writers and poets include Dinos Theotokis and Lorenzos Mavilis, but also Lawrence and Gerald Durrel wrote some of their best books on and about Corfu. The landscape of Corfu has been portrayed in paintings by Edward Lear, Charalambos Pachis, Giogos Samartzis and Angelos Yiallinas, who are only some of the great painters of Corfu. 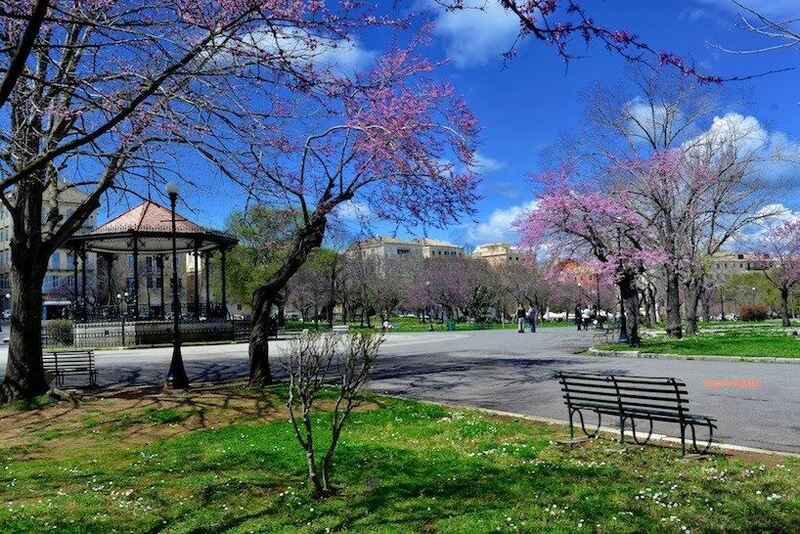 Corfu is a vivacious island where numerous cultural, religious and artistic events are hosted throughout year, from concerts, art exhibitions and festivals, to church celebrations, seminars, symposiums, theatrical shows and local festivities. 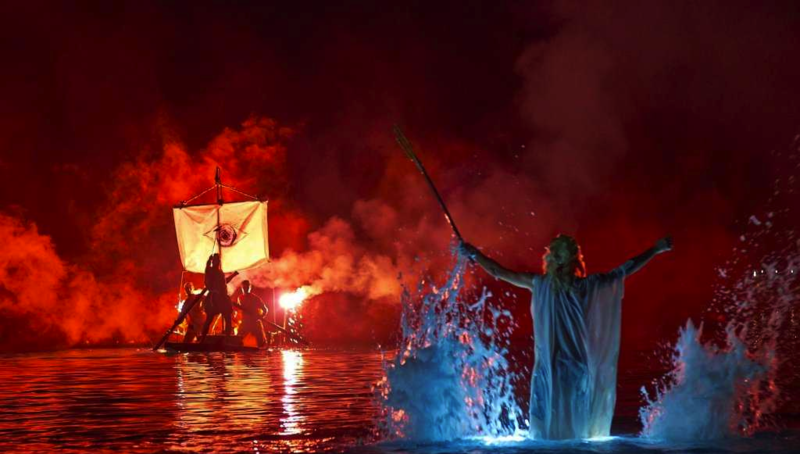 The roots of the Corfiot Carnival are lost in the Dionysiac worship of ancient Greece. 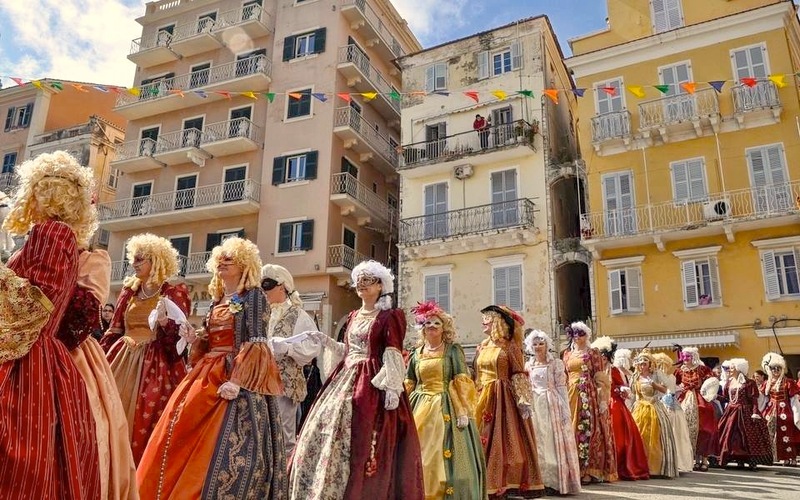 The Carnival of Corfu was revived during the time of the Venetian occupation of the island and through a course of more than 450 years, reaches our times, regenerated each year. 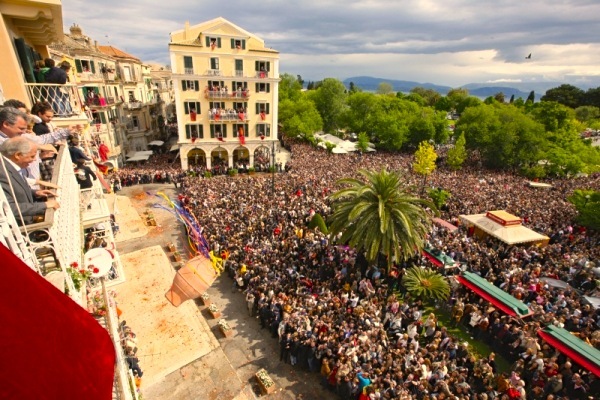 Easter in Corfu is a special event, not only because of the religious meaning of Easter, but also due to the fact that it is a time that both the Orthodox and Catholic faith celebrate, especially on the island of Corfu. Good Friday is the day of the Epitafios (a reenactment of the burial of Christ). In the evening, all churches take their funeral bier through the streets, as people follow with candles in their hands, along with the Philharmonic Orchestra and choirs. Another custom of Corfiot Easter is to throw pots from windows in the morning of Holy Saturday. At night time the Catholic Church first holds its service that finishes in time for the Greek Orthodox service and the Resurrection. 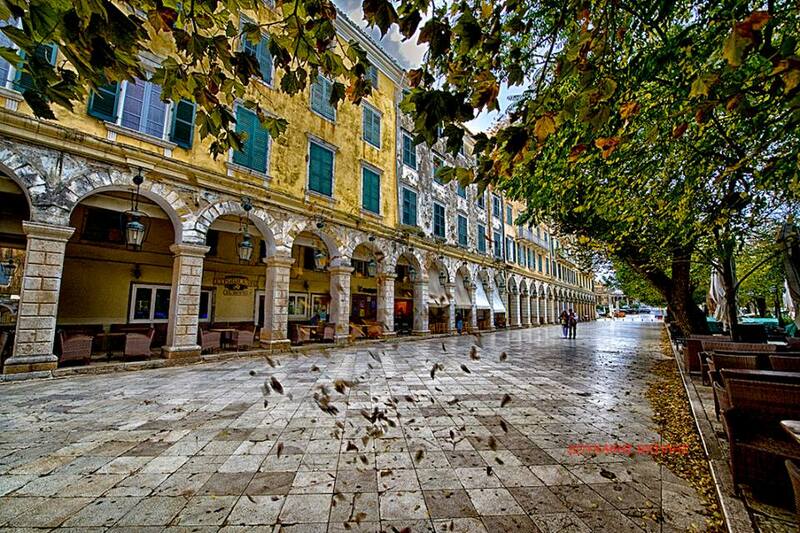 In Corfu (Kerkyra) the service is held on Splianada Square. When the bells chime midnight for the Resurrection of Christ, a celebration begins with fireworks, orchestral music and singing. An abundance of wine is consumed and local Easter dishes are served such as red eggs, fogatsa, tsilichourda and columbines. In the morning, the churches take the icon of the Resurrection through the town streets. Petegoletsa (gossips) Based on the Corfiot dialect and held each year in an open stage, in the central market of the Old City, in Pinia. It is a theatrical act very similar to COMMEDIA DELL' ARTE, and was developed in the past by the writer Theodoros Zamanis. The biggest part of them is written in satirical fifteen-syllable verses. They are performed by actors and they include old customs, traditional types of old Corfiots and most of all Corfiot dialect. 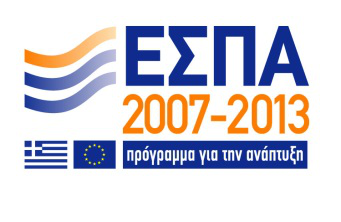 The program is enriched with local satirical or light songs or with Heptanisian kantades. The final act is culminated with a sketch (prose) performed from the windows and balconies of the nearby houses. The inhabitants of Corfu Island have great religious faith. Every year the churches hold litanies in honor of the Saints. The most significant is the litany of Saint Spyridon, the patron saint of Corfu (Kerkyra), taking place on Holy Saturday. Some others are: the Litany on Palm Sunday, the Protokyriako Litany (held on the last Sunday of November), Saint Spyridon's Litany and the Litany of Santa Theodora on Orthodox Sunday. Corfu is famous for its lovely ceramics, handicrafts, weavings and woodcarvings as well as its sweets such as mandoles, mandolato and koum-kouat preserves. Some areas of Corfu (Kerkyra) also produce delicious honey, wine, ouzo, olive oil, Ginger Beer (“Tsitsimbira”) and beer, soap, butter, cheeses and more. Renowned musicians from the USA, Europe and Greece are meeting almost every year in Corfu, with students from all over Europe: seminars, lectures, discourses and naturally, lots and lots of music. A unique connection between master and student, a chemical reaction - communion within a festival of art and culture. Starting from mid June and lasting till the last day of July, the Concerts of the Ionian invite you to musical performances of high standards at historical sites of similar aesthetics. Each year in Paleokastritsa, one of the main highlights of the summer takes place in August. This day of celebration, which starts with services in the small church of Aghios Spiridon, culminates in the Varkarola which is held in the evening. This event celebrates the miracle of Saint Spyridon, as the locals believe that it was the saint who saved the island from a Turkish siege on August 11th, 1716. That is why they celebrate this miracle with a representation of the nautical fight. Specatators gather early to ensure they have a good viewing point. It is a night to remember and a camera is a must. Be there! 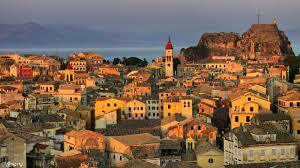 Corfu Animation Festival is an international festival, that includes Corfu as its point of reference. It aims to constitute a meeting point for animation artists from all over the world every year. The objective is to treat animation works with professionalism, and total respect for the creative effort that accompanies the 8th art. It also aims to educate (an essential that has conditioned the art of animation), and its various festival activities relate equally to children, adults, visitors, institutions, and all those with an eye to learning and experiencing through art. It is a four-day celebration of animation, but does not forget to advertise art and artistic merit in all its forms, combined with an educational glance and a time for entertainment. For those of you who create and express yourselves through animated films, this is an opportunity to submit your film. 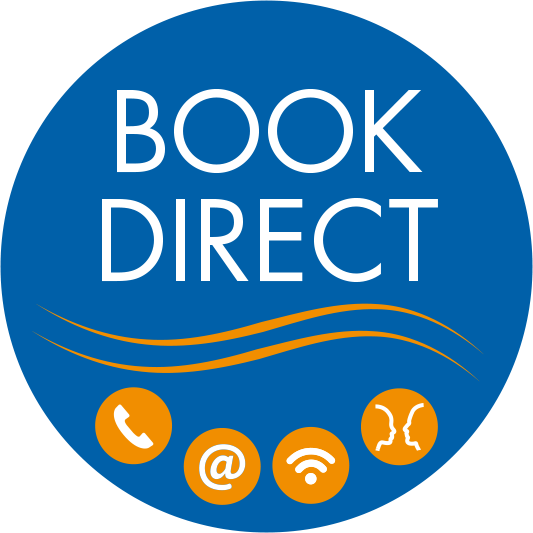 Starting from Corfu, a traditionally rich point of artistic and cultural reference, you will be given the opportunity to share the magic and joy of the image, ideas and sentiment. Corfu cuisine is a mixture of Greek and Western tastes, with elements of Mediterranean cuisine including many herbs and spices. The island’s many tavernas offer a mouth-watering range of traditional Corfiot dishes that entice both vegetarians and meat-lovers. Of course, you’ll also find all your favourite Greek foods in Corfu, including horiatiki salad, moussaka, egg-plant salad, souvlaki, tzatziki and taramosalata.